“Sleigh bells ring, are you listening, in the lane, snow is glistening. A beautiful sight, we’re happy tonight. Walking in a winter wonderland.” Don’t you just love the holidays? Trees, mistletoe, friends, family… Christmas just brings you happiness and joy! 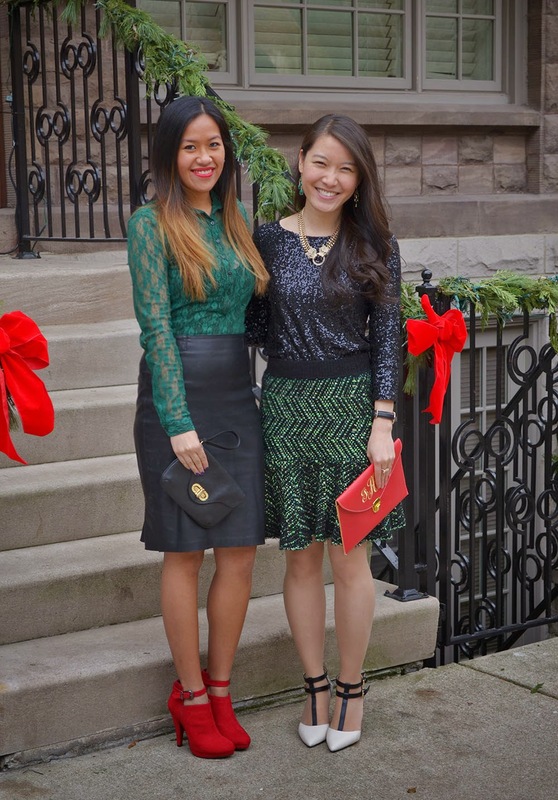 To celebrate the upcoming holiday, Joanna of Grace in Style and I decided to do a fun Christmas outfit collaboration! Check out our Christmas styles below! I met Joanna last month at the Windy City Blogger happy hour event, and I am so thankful for that. She is one of the most sweetest gals I have ever met! We have a very similar style; and we did not even plan to wear opposite colors! I hope you are inspired by our different Christmas styles this year! Check out Joanna's Blog here for more pictures from our shoot and where to find her outfit! What's your favorite Christmas outfit? Comment below and let us know what your looks! Thanks to everyone who participated and entered our holiday giveaway! The winner to my giveaway is Kathy Lickey... Congratulations!! Thank you dear! Can't wait to see your holiday collaboration looks!! Loving this post! Green instead of the typical red is a great choice for holiday fashion! Your outfits are perfect for the holidays! Gorgeous as usual both of you!